How can economists define social preferences and interactions? Culture, familial beliefs, religion, and other sources contain the origins of social preferences. Those preferences--the desire for social status, for instance, or the disinclination to receive financial support--often accompany predictable economic outcomes. Through the use of new economic data and tools, our contributors survey an array of social interactions and decisions that typify homo economicus. Their work brings order to the sometimes conflicting claims that countries, environments, beliefs, and other influences make on our economic decisions. Upper-division undergraduates, graduate students, professors, and professionals working in all segments of economics and finance. 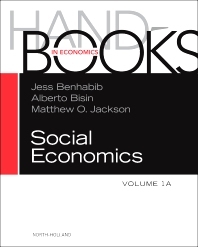 Alberto Bisin is Professor of Economics at New York University and an elected fellow of the Econometric Society. He is also fellow of the NBER, the CEPR, and CESS at NYU, CIREQ. He has been Associate Editor of the Journal of Economic Theory, of Economic Theory, and of Research in Economics. He is founding editor of noiseFromAmerika.org and contributes op-eds for the italian newspaper La Repubblica. He holds a Ph.D. from the University of Chicago, obtained in 1994. His main contributions are in the fields of Social Economics, Financial Economics, and Behavioral Economics.